SGM heating mantle is used to apply heat to containers, as an alternative to other forms of heated bath. 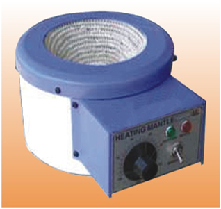 In contrast to other heating devices, such as hotplates or Bunsen, glassware containers may be placed in direct contact with the heating mantle without substantially increasing the risk of the glassware shattering, because the heating element of a heating mantle is insulated from the container so as to prevent excessive temperature gradients These have epoxy resins coated aluminum body with glass yarn mantle and an operating voltage range of 220 Volts. These are fitted with an energy regulator and have maximum working temperature limit of 350 degree Celsius. 1. Maximum Surface Temperature 4500C. 2. Two and Three Zenol distributed heating. 3. Body made out of thick Aluminium sheet. 4. Thick hand knotted fiberglass heating shield applications. 5. Easy replacement of spares. 6. Built-in remote controls for fume hood operations & safety.